My mom, sister, and I have been on a washer necklace making kick lately. I really love how this Industrial Strength Jewelry looks! You can buy the metal stamps from Harbor Freight Tools for about $5 (here’s a 20% off coupon if you are interested). Once you have decided on a saying or word for your washer, hold on tight to the stamp and give it one firm and quick swing with the hammer. The wood actually wasn’t hard enough and we ended up moving to the tile floor. Concrete would also work. Once you have the washer punched, color the entire surface with a black magic marker. After the marker has dried, spray with hair spray and wipe off. This will turn the letters black and help them show up. Then trace the washer onto the paper and cut out. Cover the washer with glue and then set the paper on top. 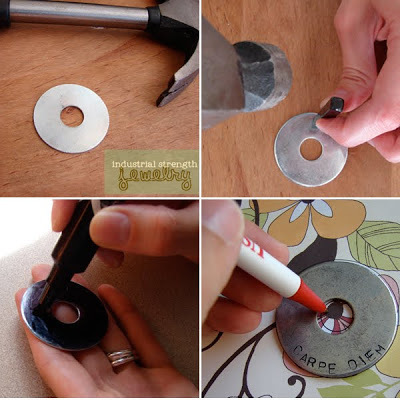 Most likely your cutout will be larger than the actual washer–this is okay. Glue the paper on and wait for it to dry. Once it is dry take your piece of sand paper and smooth off the edges. This will take care of any excess paper and give it a nice finished edge. 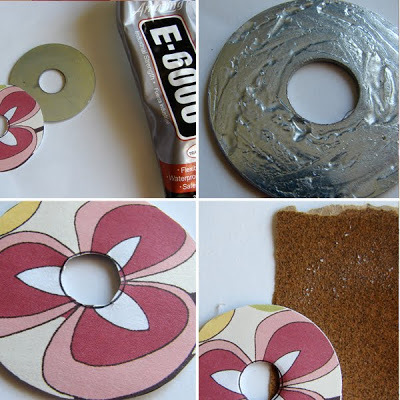 Cover with Mod Podge, dry, and repeat as many times as you would like. I like put on think coats of Mod Podge so it gives a bubble or glass look to it. Just make sure you let each layer dry before adding more. Cut the wire to the desired length, add the closures to the ends. Add a bead if, you so chose, to a little piece of wire twisted at the ends. Fold wire in half, slip through the bead and then through the hole in the washer, and back between both strands to finish it off. And because you already have everything out, you might as well make a few! 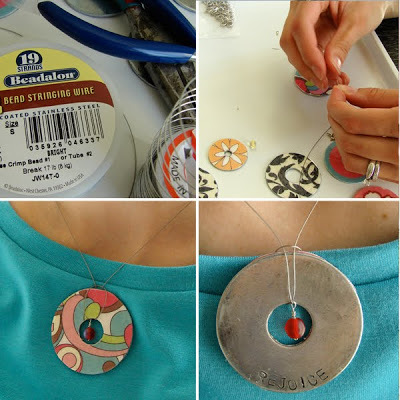 Looking for more DIY Jewelry Projects? 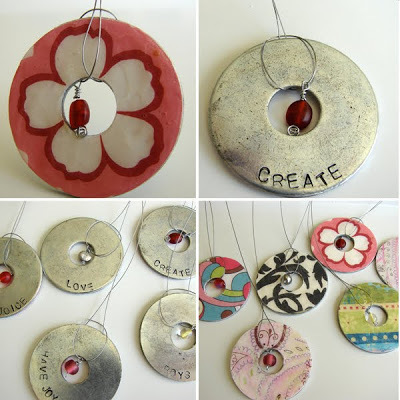 Don’t miss THIS Mod Podge Jewelry: 20 Project Ideas to DIY post. And this DIY Personalized Photo Jewelry post. Yay! I just started making some! Nikkala, I think this would be a good thing for our workshop enrichment. Got a cost estimate? Interested in teaching it? What size stamps do you use? I definitely want to make some. OH MY HECK, sooo adorable! I am excited to make some. I just found your site and I love it!!! I have to tell all of my family about it. You have the cutest crafts. I just went through all of your posts and i am so excited to cuten up my home! thanks!!! These are amazing. Thank you so much for sharing. Something fun for my sisters and I to do together! Thanks again. Riki Lee – My stamps are 1/8″. Have fun! where to get the stamps? Nikkala-you clever cat-I love them! Why can’t you move and be my neighbor!! Aww, how pretty! I like the idea of teaching this to a group, it would be perfect! Thanks so much, I’ll be linking to this. These would make great gifts! I’m excited to make some! So cute! I am definately making these little numbers-so fun! Your washers are adorable. I love these necklaces and I like the variations you have made with the metal stamping and the wire for the “string.” I am featuring this on somedaycrafts.blogspot.com Grab my “featured” button and come back often! what type of stamps are these and where can they be purchased? What size are the stamps? Where can you get them besides the one location you mentioned? What size are the washers? I LOVE this idea! I want to do this for my neighborhood craft group early Oct. but have to figure it out myself first of course. Please help! LOVE these! great idea for my girls to make! how do you keep the necklace on? do you ahve to put a clasp on the end? This would be an AWESOME girls’s camp activity! what type of clasp is used, and doesn’t the plain stringing wire bother your neck/skin?